Bee-keeper keeps in hand honeycomb frame with bees on it. There’s a renewed buzz in honeybee research when it comes to problems within the hive. AgNet Media’s Sabrina Hill talks with a bee care program leader and a bee researcher. New research shows more threats to honeybees. There is a lot of talk in the general public about pesticides and bees. However, Project Manager with the North America Bayer Bee Care Program, Dr. Becky Langer, says pesticides aren’t the only concern. While the Varroa mite is a top contributor to the decline in bee health, new research shows there is another pest impacting the important pollinators as well. Nosema is a microscopic fungus with spores that survive on the wax combs and stored food inside bee colonies. Bees eat the spores and the fungus attacks the intestinal lining. Infected bees cannot properly digest their food and die from the lack of nutrition. According to a 2011 paper by University of California-Davis Extension Apiculturist Eric Mussen, nosema infections can decrease the lifespan of worker bees by as much as 78 percent. Infected queen bees can die within a month. The hive is left without a queen and often dies by the following spring. Mussen conducted research on nosema in Minnesota. He found that bees can carry as many as 50-million of the spores per bee, and it takes only one-million spores per honeybee to cause an increase in winter losses. Mussen is now retired, but research like his continues. Langer points out the work of researchers has found that several things are contributing to problems in bee health, beyond the varroa mite and nosema fungus. 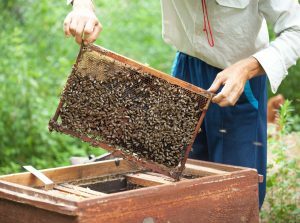 There are a number of programs for farmers and non-farmers to get involved in providing bee forage.